In a restaurant that calls itself a “burger joint” and is best known on Yelp for its “pork face nuggets”, you wouldn’t necessarily expect to find creative, seasonal, dare I say, inspired vegetarian dishes populating the menu. But Back Forty West in Soho, the successor restaurant to the former neighborhood gem Savoy, delivers a number of surprises. 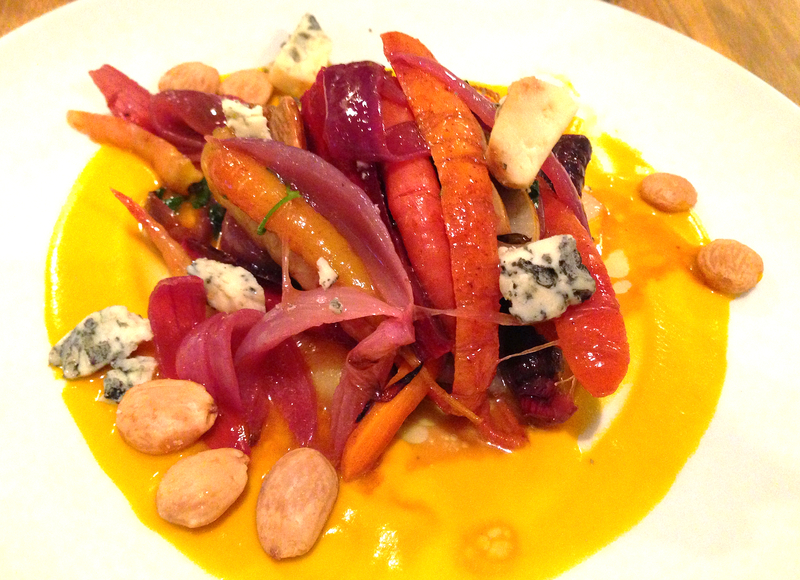 For example, its baby carrot salad (pictured above) was an unexpected home run. With carrots so homely you just know they have to be healthy for you, this symphony brilliantly combines toasted almonds, pickled onions, fresh baby carrots with a blue cheese crumble and a fresh carrot puree. Why was it surprisingly good? Maybe it’s because the restaurant appears like a relaxed burger joint/wine bar from the street and keeps well hidden a cool upstairs dining area. Or maybe it was something about the menu layout that gave me the impression that I wouldn’t be impressed. But appearances can be deceiving and sometimes you just have to let the food speak for itself. This salad didn’t speak so much as it sang. If you enjoy a relaxed atmosphere and responsibly sourced, organic, in-season vegetarian dishes, I’d highly recommend stopping in and trying a dish off of this ever-changing menu, so long as you can muster the discipline to suppress the urge to order the pork face nuggets anyway. Happy and healthy eating! That was the first guest post on this blog from my friend JG – lawyer, guitarist, and gourmet food aficionado. Thanks, JG, for this post, saving me time from writing one myself, and, not in the least for making me want to try this roasted carrot and Asian pear salad with blue cheese and marcona almonds.